Make delicious chicken for tacos in just a few minutes using your pressure cooker and favorite prepared salsa. Instead of watching and stirring as the chicken cooks, you have time to prepare all your fresh toppings! A selection of shredded cabbage, your favorite cheese, sour cream, sliced avocado, and fresh cilantro gives everyone options to make dinner their own. 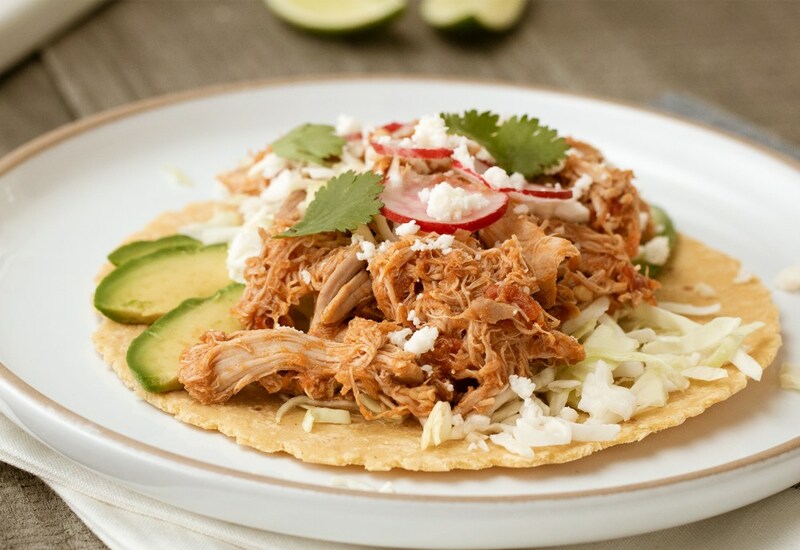 Both corn and flour tortillas or even a lettuce wrap all taste great with Pressure Cooker Salsa Chicken. Be sure to read the label on the salsa if you are following the Whole30 diet. Or make your own salsa. In this recipe, your choice of salsa will dictate the flavor profile. If you like it spicy, go for the hot salsa. If you are more mild when it comes to mealtime, choose your salsa accordingly. If your chicken is still a bit tough and doesn't shred easily, cook it on High Pressure for 5 more minutes! Per Serving: 267 calories; 12g fat; 4.3g carbohydrates; 38g protein; 184mg cholesterol; 817mg sodium. Oh my god, easiest dinner ever. I used the fresh pico de Gallo from the refrigerated aisle. So flavorful, can’t believe how easy this way. This salsa chicken was delicious. I made mine with green salsa and used the meat for enchiladas. Loved it! Super quick and easy. Best salsa chicken recipe! It doesn't really get any easier than this my friends. I always pair it with warm flour tortillas and whatever toppings I can round up. This is for those nights when you want to put in little effort but have a big appetite. This literally took just a few minutes make in my pressure cooker. I used basic store bought, jarred tomato salsa. I didn't use many toppings, simply avocado, cilantro, and sour cream. I also used flour tortillas. So yummy! These tasted like real tacos! Just as good, if not better than the ones you'll get at a restaurant. I used my mom's homemade salsa recipe and it resulted in juicy, tender meat that was infused with delicious flavor. This is the only recipe I use for chicken tacos now. I make this regularly and use a locally made spicy pineapple salsa. Then I serve this over rice with all the usual taco fixings, such as shredded lettuce, cheese, pico, avocado, mexican corn, black beans, etc. Everyone can add their favorites and have a delicious taco rice bowl. It’s a new family favorite! Delicioso! This is a keeper for sure! We love this, so easy. We make burritos with this recipe, fresh guacamole, mexican rice and black beans, fresh tomatoes and shredded cheese to make amazing burritos. I used boneless, skinless chicken breasts cut into 1 inch slices as breasts are usually thicker than thighs. For the salsa I used WalMart’s Great Value Medium. I didn’t reduce it as shredding the chicken “absorbed” a lot of it and I wanted it fairly wet for Mexican lasagna. I was astonished at how good this tasted and how the salsa flavors, especially the heat of the peppers, were so enhanced. Love this and so good and easy. We added peppers and onion. Love the flavor of the thigh, curious how it would be with boneless breast?! quick easy and delicious!! definitely making again! I made it with boneless skinless breasts and everyone in the family loved it.